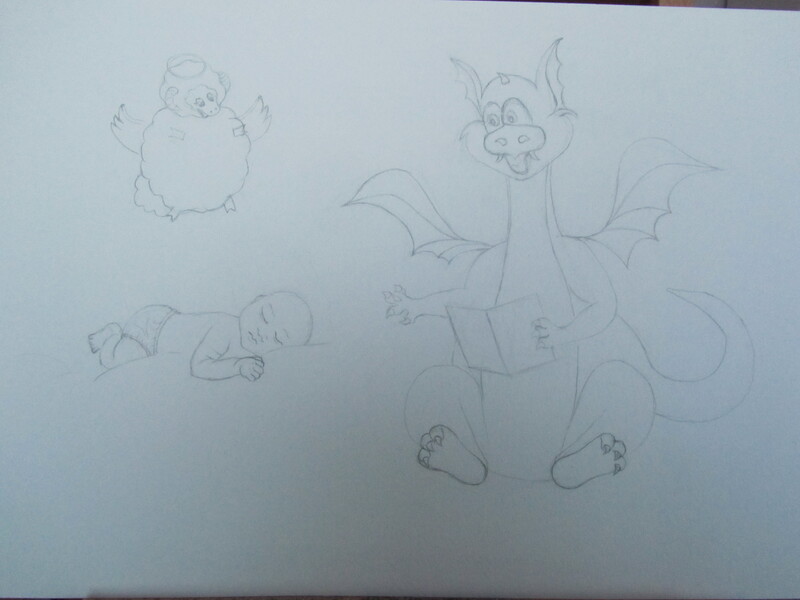 I have been asked to draw a picture for my friend’s baby which they will hang up on the wall of the baby’s room. They live in Wales and the Welsh dragon and sheep are famous over there. 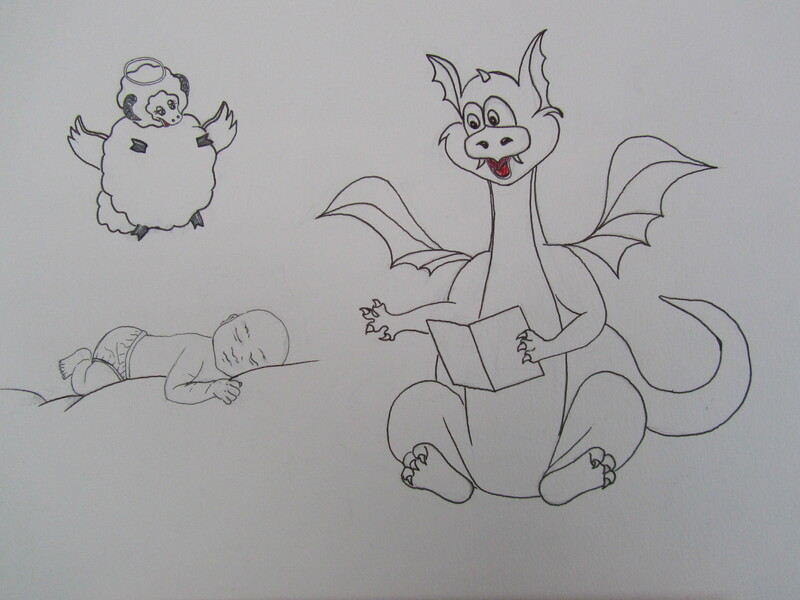 So I have drawn a dragon that is reading to the baby. The Book is The BFG by Roald Dahl because that is a favourite children’s book of the parents. The sheep takes the form of an angel giving a blessing to the child. 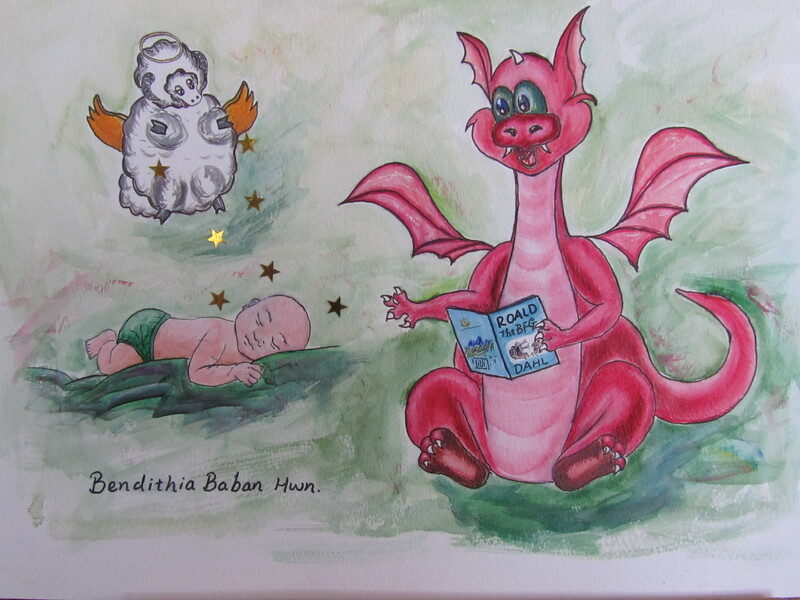 Bendithia Baban Hwn in Welsh means bless this baby. In this exercise I need to write a brief for an illustration whose work I found some connection with and I admire its conceptual or narrative dimension. I have chosen an illustration based on anthropomorphism of Peter Rabbit by illustrator/author Beatrix Potter for this exercise. Before starting to get the context I have read her life story. Beatrix Potter’s career as a children’s illustrator and storyteller began when the tale of Peter Rabbit was published. Beatrix Potter spent a lot of time in the Lake District exploring and sketching the wildlife because she loved the Lake District. This and the farm house gave her the interests and her joy and inspiration for many of her famous tales. As Beatrix Potter’s most popular and well-loved tale Peter Rabbit which has adorable illustrated bunnies pictures and the story of a very naughty bunny with his friends and his troubles in Mr McGregor’s garden. She used anthropomorphism to create a series of stories based around animal characters that gives life to or depicts animals as human with hands, feet, shoes, jacket and facial features. With her humorous, lively tales and adorable illustrations she produced beautiful children’s books. Also as she lived in the Lake District she put the best natural views in her stories’ background. Beatrix Potter developed her own style and was at her best when she anthropomorphised the animals in her stories that is the part that I admire. Her story of writing is very poetic and the style of illustrations are gorgeous. I have watch her film she used the pen-and-ink for sketches in the letter and I also read the Peter Rabbit original with black and white drawing but was refused by several publishers but she printed some for family and friends until at last the book been replaced with colour sketches. Brown rabbit with blue jacket for him and his mum, red for his sisters, they made the beautiful images for children. 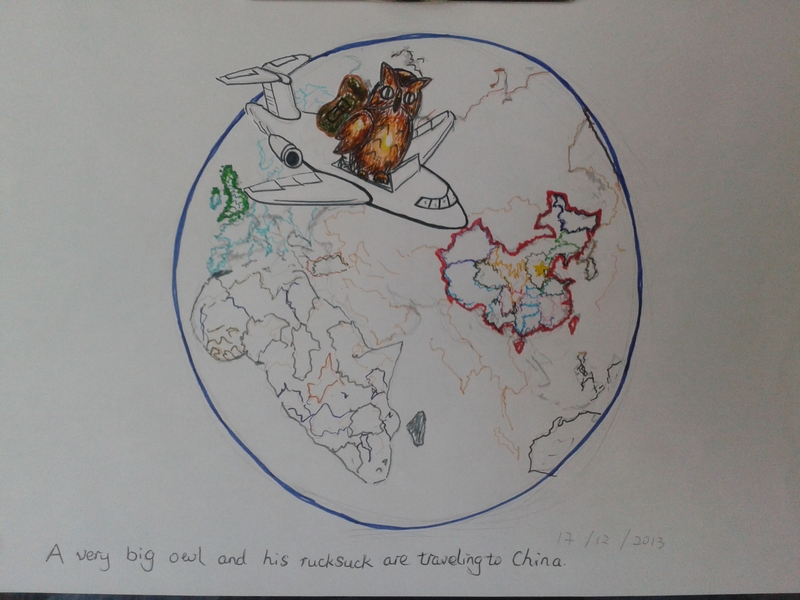 Brief: Illustration to be used for a children book. 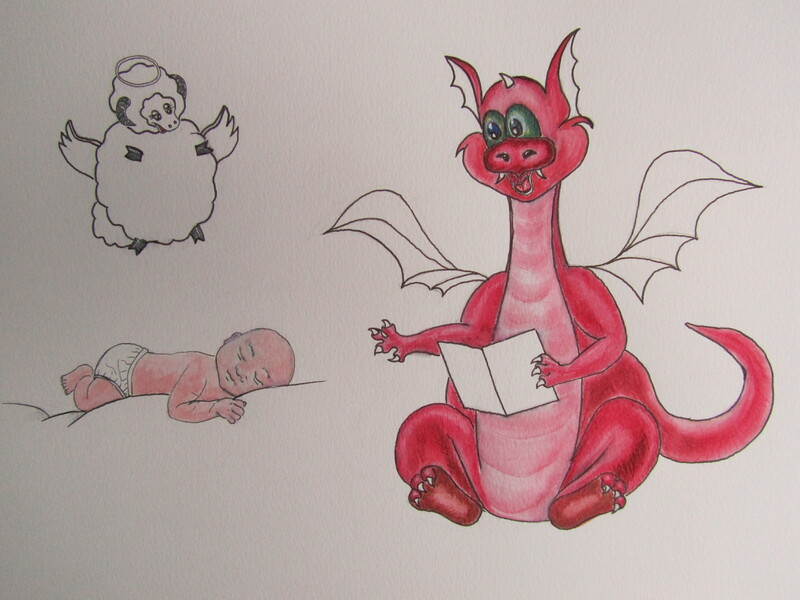 The best method of illustrating for a children book is with animal characters. The anthropomorphism of facial features would make children’s infantile psychology ardently love nature. Children books have many adorable pictures which simple describe the words of the story. The interests were deeply influenced by fairies, fairy tales and fantasy. A children’s book doesn’t dumb down for them. 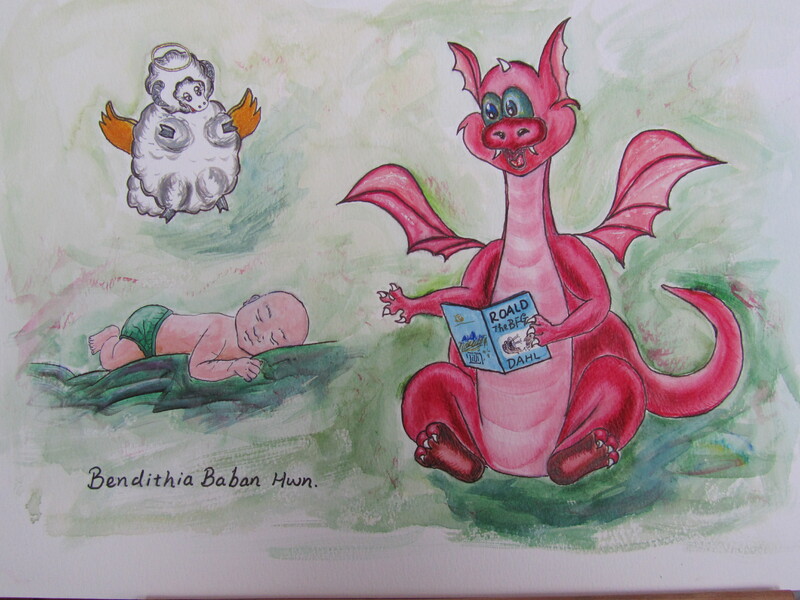 Children should relish a bedtime story and the parents who read for them should find it charming with delightful images. The stories should tremendously gripping but not so much as to make young children scared. It should appeal to 3-8 years old children so that they will learn from the illustration pictures the nature of a rabbit. What should it look like a how should it be drawn. The illustrations should be bright and colourful so they stand out from the page. The use of bright primary colours would appeal to children. The illustrations should anthropomorphism the animals as much as possible giving them human shoes and clothing and facial features. One of the world book day 2014 Authors. She is an author/illustrator with exceptional talent. She twice won the Kate Greenaway Medal. I appreciate her sharp wit and seemingly effortless drawing that have created such brilliant picture books. I do like her book “The Rabbit Problems”, this is outstandingly original including a baby rabbit record book, a carrot recipe book with all the interesting rabbit pictures. I enjoyed the great detail especially the surprise pop-up ending. It is an entertaining book packed full of gorgeous rabbitty features and novelty elements. It has extraordinary pictures and charm and whimsey. She pays studious attention to detail then makes books that are stunning. With its many fun activities and beautiful vibrant illustrations it makes me want to read more and love it and others. I has been asked to send a ‘greetings card’, telling my tutor about myself, my interests and inspirations, the materials I feel happy working with and maybe what I would like to get from the course. First of all I need to work out what I want to say. 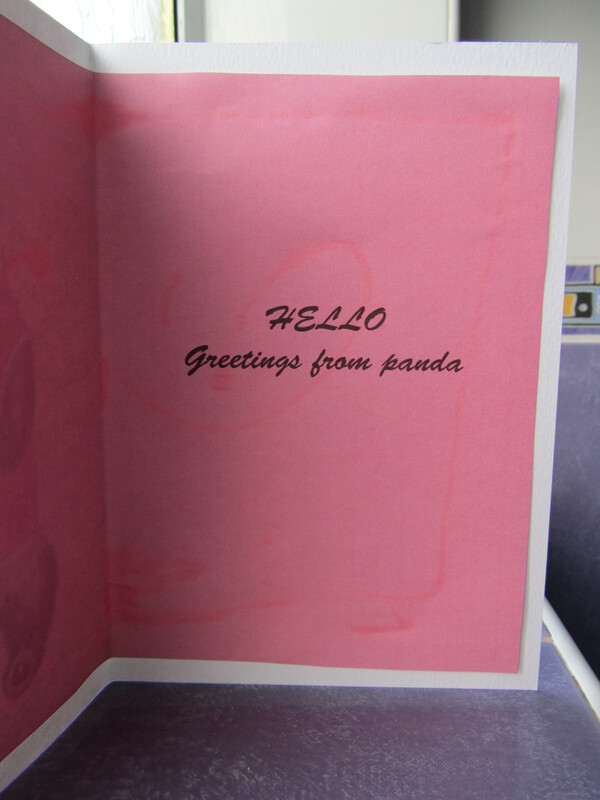 My name is small panda I was born in China and have been in UK about 4.5 years. I live with my husband and lots of soft toys. 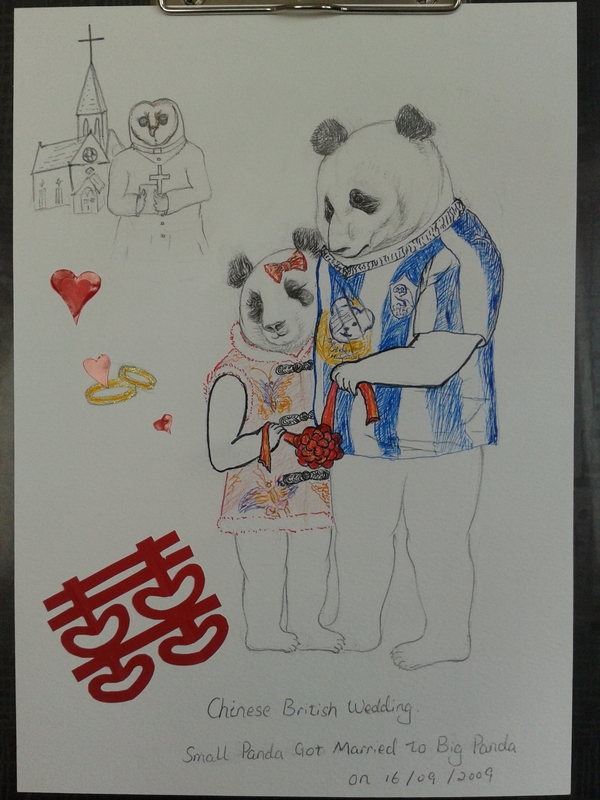 Since my husband has been to China then he has been called a panda as well. 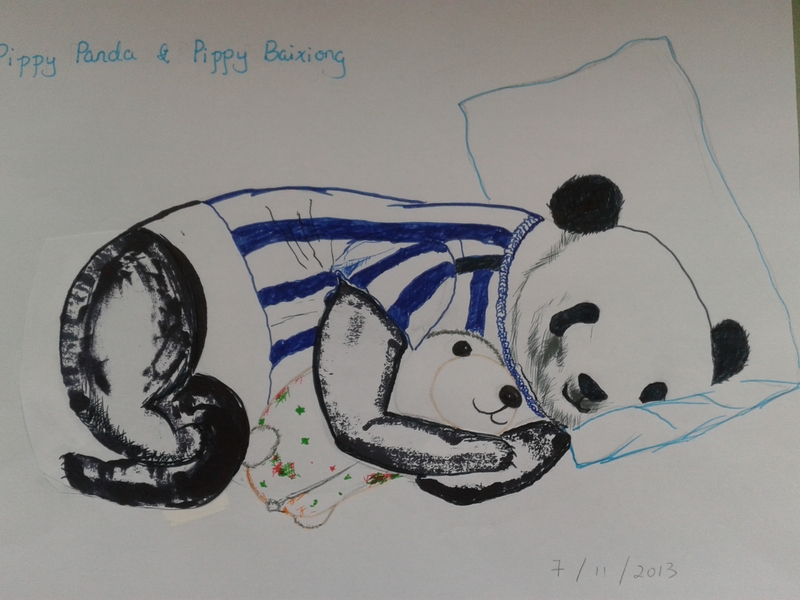 So our story includes big panda, small panda and lots of toys who came from China. One of the toys is our favorite polar bear called Baixiong who is like a pillow and is our best friend for sleeping. For this assignment, I am thinking how do I to use my language to say hello or convey the greetings to my tutor. A ceremonial embrace, as a greeting or salutation. Different countries follow different ways like hug and kiss, blow a kiss, shake hands, nose touching nose etc. So I am trying to use some body languages which is from ancient China, a hand symbol or hand gesture. 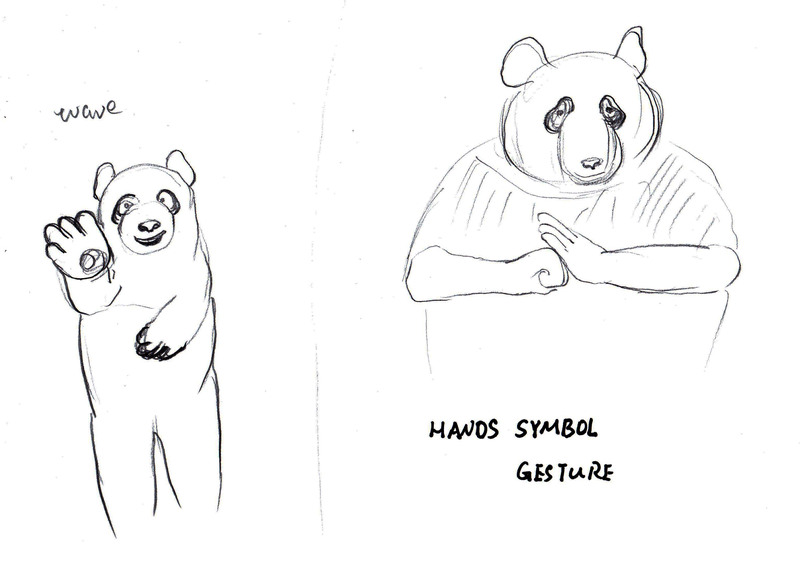 I tried drawing some pandas to say hello by waving or with a hands symbol/gesture. 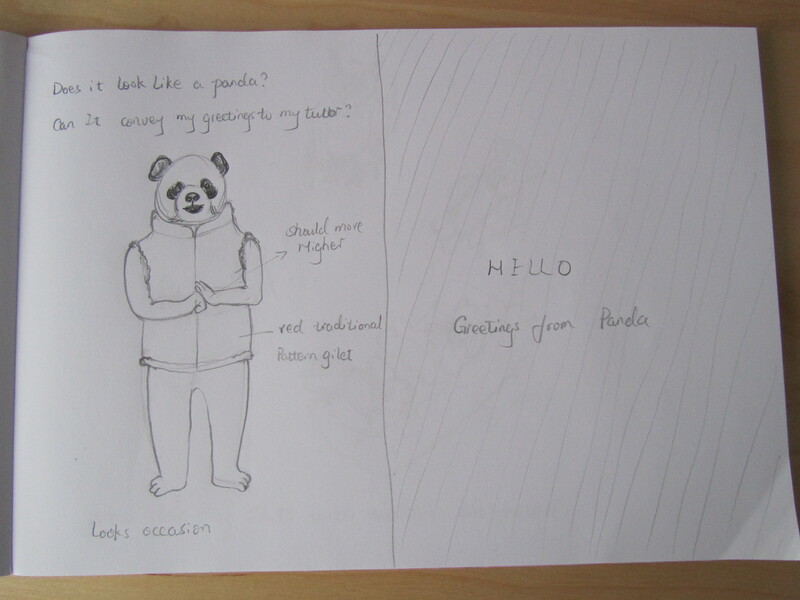 Then I drew a character of a panda which is a bit like me. 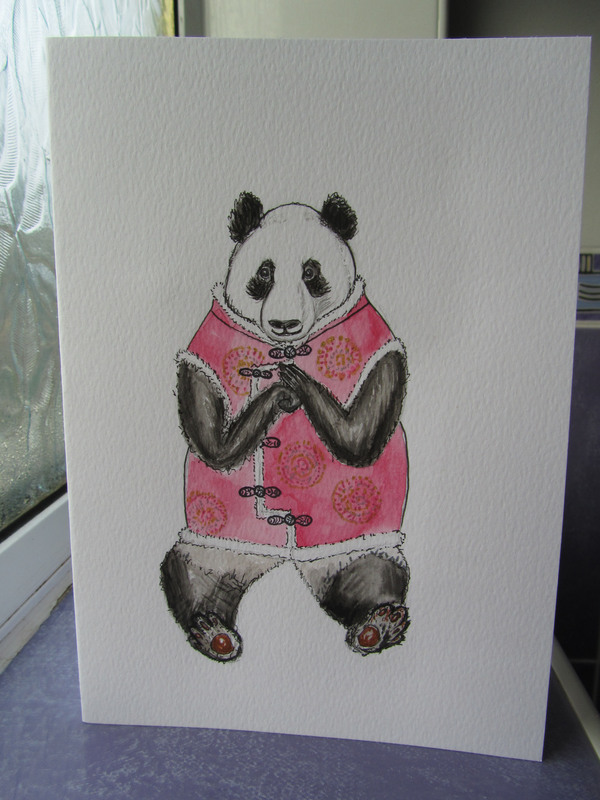 I also drew a red Chinese traditional gilet with circle sparkle pattern on. The gilet is to convey a festive atmosphere and makes the picture colourful.